The Rebels head to Limerick as underdogs for the provincial decider. 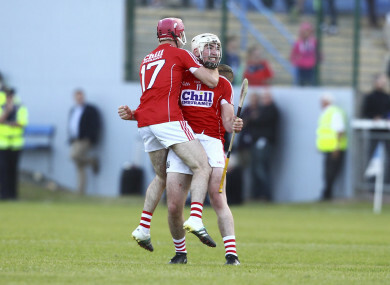 Rebel rising: Dalton and Lowney celebrate their dramatic win against Waterford. CORK HAVE MADE three changes as they bid to stun hot favourites Limerick in Wednesday’s Bord Gáis Energy Munster U21 hurling final. The Rebels haven’t won provincial honours at the grade since 2007 and will have to do without two of their senior stars if they are to end that wait in the Gaelic Grounds (7.30pm). Darragh Fitzgibbon is suspended after failing to have his red card against Waterford overturned while Luke Meade, who missed that dramatic semi-final win through injury, is not named in the matchday squad. David Lowney is named in Fitzgibbon’s place in midfield while the other two changes see John Cashman start at corner-back and Tim O’Mahony at corner-forward, with Billy Hennessy and Aaron Myers missing out. Email “Cork missing senior pair as they make 3 changes for Munster U21 final”. Feedback on “Cork missing senior pair as they make 3 changes for Munster U21 final”.